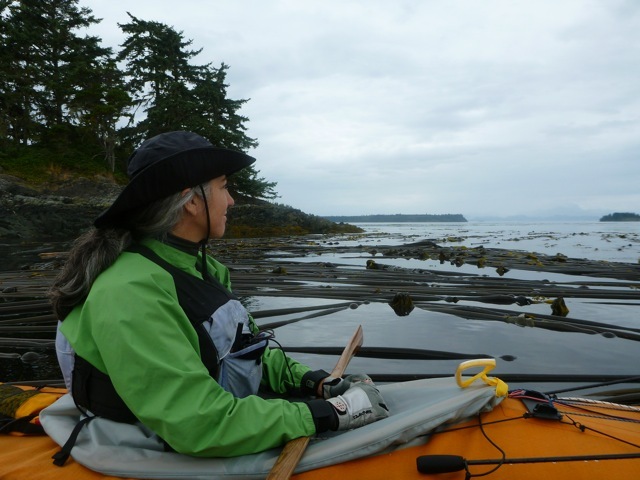 This Summer we traveled to northern Vancouver Island in British Columbia to do some exploring. 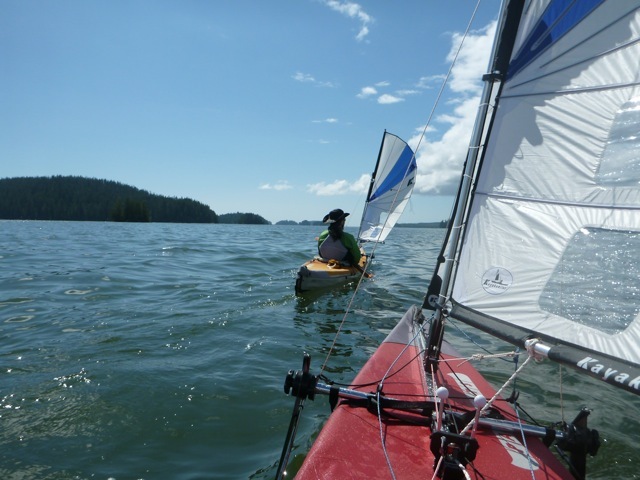 It’s an amazing place to paddle-sail with vast amounts of protected water and abundant sea life. 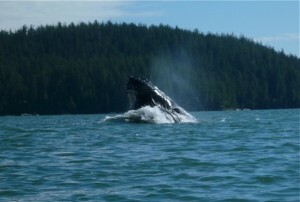 Sailing with the humpback whales was a completely new experience for us. Witnessing the sheer size and power of these amazing creatures, especially in such beautiful surroundings, left us in awe and profoundly changed. I’ll try to describe the experience, even though my words can’t do it justice. 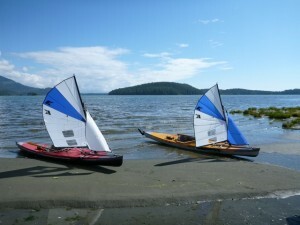 You are paddle-sailing in a beautiful deep bay. We’re surrounded by the distant cry of gulls, and the gentle, rhythmic sound, of sea water, lapping against the hull. The sky is a soft hazy blue. Around us, are gently rounded evergreen mountains that seem to be reaching up to the cottony clouds, which appear to be slowly moving from west to east. The weather is mild, tee shirt weather. 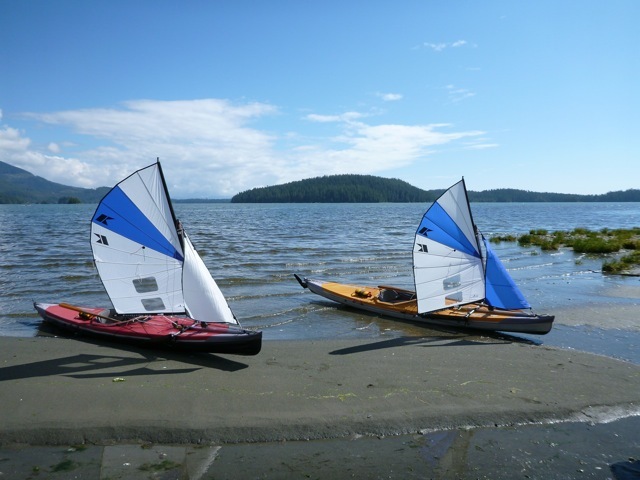 The sun is on your cheek and you are very comfortable, sitting in your kayak, happily sailing along, intermittently humming that tune that’s been stuck in your head ever since hearing it this morning. To your left, you notice some movement. A bald eagle leaps off a high tree limb, causing it to spring back with the release of its substantial weight. It flies along the shoreline with powerful wings flapping intermittently. The glide is graceful with wings, outstretched. 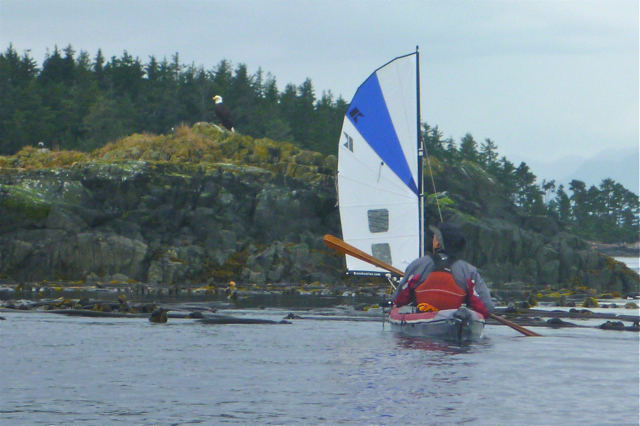 It may be searching for a salmon, or heading back to the nest. you don’t know, but as it soars, your eyes follow, and across the water, in the distance, you think you see the lingering spout of a whale. A faint misty-white line that shoots high into the air, slightly swirling at the top. It looks just like that drawing of the whale you remember seeing as a child. That’s pretty cool. Which way is it moving? Then, searching for another, you see something on the surface of the water near Patti’s boat. A log? The head of a sea-lion? Maybe a harbor seal — you can’t tell. Then it disappears without a ripple. Probably a seal, you think. Patti shouts, “Did you see that seal? It was checking me out. I think she is curious about the sail. She’s been following me for a little while”. A steady breeze has been blowing for the last several minutes and you’re holding an nice beam reach of about five knots. It’s easy sailing. The air is warm. It smells slightly of brine. Just then . . . you feel . . . a sensation. It’s primal, like the feeling you get when you know that you are being watched, and look up just in time to see someone staring at you. 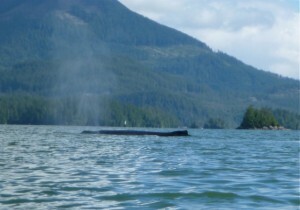 Suddenly, the surface of the water bulges to your left and a huge whale rises from the depths and blasts out a loud, long exhalation of breath. PHOOOOOOOH!! A powerful breath, a mammal’s breath, a really big! mammal’s breath. You’re startled, frozen in a moment of shock, not sure what to do even if you could do anything. The breath sounds oddly familiar, almost human, like the sound you make when coming up to the surface, after trying to swim the entire length of the pool underwater, only it’s much louder, and deeper. The moment passes in slow motion. Then, the inhalation, the blowhole closes, and the creature gracefully submerges. Wow!! is all you can say. Wow!… Wow.. Did you… see that..? Did you see that? Did the whole world see that?!! We look at each other and smile in amazement. Wow. Awesome. Experiences like this shock us into connection with our surroundings, instantly transporting us to a place where we are aware. We look at the birds and the trees, and everything for that matter, with new eyes. 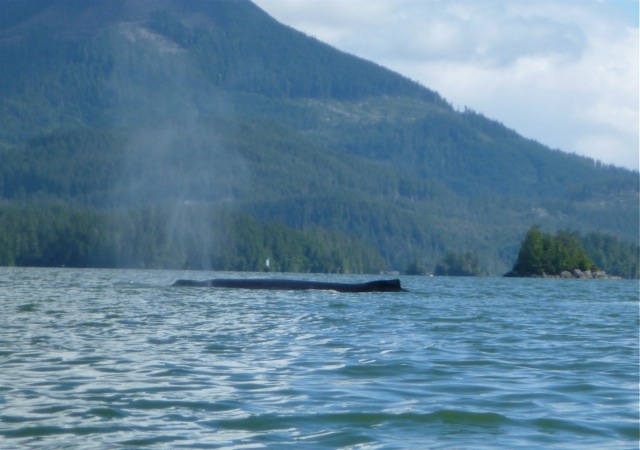 I’ve thought much about our whale experiences in British Columbia. After researching the topic, and in retrospect, we probably should have made more of an effort to avoid being in the path of the whales, for their protection as well as ours. We have since learned that staying a minimum distance of 200 yards away is prudent. It’s actually a law in Canadian waters. Even though these are baleen whales, which feed on very small sea creatures by sifting water through the baleen filter, I could not help thinking of the Jonah story, especially when one would surface nearby with its mouth wide open! The thought of a whale the size of a bus lifting our boats into the air is not very appealing. But in truth, we never felt threatened by these intelligent creatures, though more than once they unexpectedly surfaced near enough that it indeed caused a startle. When immersed in the sounds made by the rippling water being parted by the bow, or feeling the sensations of the sea breeze quietly whispering in your ear in a way that only the sea air can, you feel you are observing the true nature of things. Which is, of course, that we are part of a bizarre, energy-filled, and incredibly beautiful system. Natural environments seem to have a way of conveying this. While the gentle breeze whispers it to you, finding a whale next to your boat shouts it loud and clear! Please feel free to leave a comment. We love hearing from you. A very very good account of your experience, thank you for sharing, many will now want to sail in your wake. Although this is an encounter of the huge kind, in Australia, i equate it with paddling, and spotting platypus. Like whales, they are unique in they,re own way, and when you are on the water, and they are about, you never know when or where they will surface for air. Do u have a kit for a perception sport kick 9.5. Please send us an e-mail. We are always happy to help. What a great video and I love Nichole’s music!! I’m from Holland, Europe, so please, exept my excuses for my bad english. 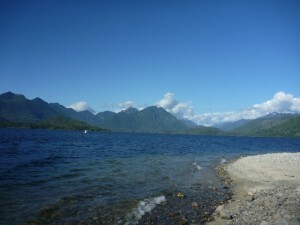 Many times i’ve looked om your site, and now what a beautiful film you ‘ve maked on the waters nearby Vancouver island. It must be very exiting to look at the whales that close. Thank you very much for publishing. That was an awesome video, thanks for sharing it. I always see that truck in some of your pics and wonder if it’s still the one from the Keys. The I saw it turn 260K and I chuckled. can’t beat a good truck. The whales were amazing. You two are truly blessed. It’s been a long time. Thanks so much. Yep, same truck. She’s a good old gal and quite reliable. Amazingly, she had her first set of brakes replaced on this trip! I know it sounds incredible, but it is true. We were in this little out of the way town in northern Vancouver island and the local mechanic couldn’t believe it either. We explained that down in the Keys the roads are flat-flat, people drive slowly, and there are almost no traffic lights. He still scratched his head. It was super fun to paddle with the whales. We can’t wait to sail up there again.